That’s how, for years, regulars at Manuel’s Tavern have navigated out-of-towners or local first-timers to their beloved neighborhood bar on the corner of North and North Highland avenues in Atlanta. 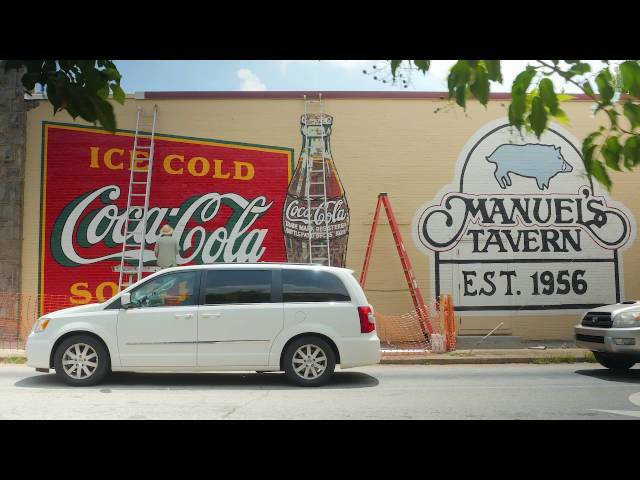 And now, thanks to Coca-Cola, the two vintage “ghost signs” have been refreshed just in time for Manuel's 60th birthday. Owner Brian Maloof approached Coca-Cola about restoring the wall signs to their original glory last year as the landmark watering hole prepared for an extensive interior renovation. The company agreed to fund the project, hiring a crew of lettering artists led by Jack Fralin of Roanoke, Va., who spent a week in late-July scraping, repainting and sealing the faded murals. The signs were originally painted for the Atlanta 1996 Olympic Games and have since been featured in The Coca-Cola Company’s annual report and as a backdrop to countless photographs featuring U.S. presidents, celebrities and local dignitaries. Manuel's Tavern Owner Brian Maloof in front of one of two recently restored Coca-Cola wall signs flanking the beloved bar. Indeed, for more than six decades, Atlanta’s movers and shakers of all stripes have convened at Manuel’s over an ice-cold beer or Coke to hatch ideas, broker partnerships and more. Manuel Maloof, who co-founded the tavern bearing his name in 1956, behind the bar in the early days. Brian’s father, the late Manuel Maloof, opened the tavern in 1956 with his brother, Robert. “They ran this place with a character, charm and love that has endeared this place to so many,” Brian said. The son of a Lebanese immigrant, the tavern's namesake was the former CEO of DeKalb County and chairman of the Atlanta Regional Commission who became known as the godfather of the DeKalb Democratic Party. He passed away in 2004. He also attributes the tavern’s longevity and appeal, in part, to its prime Poncey-Highland location – equidistant to several Atlanta-area colleges and universities. Manuel’s closed in December for renovations, which will retain the bar’s spirit – and most of its original footprint – with modern-day enhancements including an upgraded kitchen and new electrical and plumbing. The tavern reopened earlier this month to the delight of regulars and newcomers alike. “This place is a big part of a lot of people’s history,” Maloof said. “It’s astonishing to me to have someone come in, sit at the bar and say ‘This is the place where I had my last stateside beer before shipping off to Vietnam. Or, ‘This is where I was sitting when I watched man walk on the moon on a black-and-white, flickering TV. Coca-Cola Consolidated hosts community celebrations, like this one in Knoxville, Tenn., to unveil restored murals. Coca-Cola has been in the mural business for over a century. The company commissioned its first wall sign in the 1890s and, by 1910, they accounted for 25 percent of the company’s total advertising budget. To ensure consistency and protect the integrity of its trademark, Coca-Cola distributed how-to playbooks to local bottlers with detailed instructions to pass along to contract artists starting in 1923. The manuals included style guidelines, approved scripts and paint colors, and other do’s and don’ts to ensure a seamless look across the country. But by the 1950s, small-towners flocked to larger cities, and businesses fled downtowns for the suburbs. Billboards gradually replaced painted signs, which were costlier and more time-intensive to produce, and the vintage ads almost completely disappeared by the ‘70s. The Coca-Cola Company distributed playbooks to bottlers and sign painters in teh early-1900s. Painters including Jack Fralin and Andy Thompson continue to use the books a field guide to reference while restoring the iconic murals. Main Street mounted a comeback in the late-‘80s and early-‘90s, however, thanks to a renewed interest in historic preservation. For many towns, bringing back the beloved signs has been a logical way to tap into a sense of nostalgia. Charlotte, N.C.-based Coca-Cola Bottling Co. Consolidated, the nation’s largest independent Coca-Cola bottler, has hired Fralin and other sign painters to restore dozens of murals across its distribution territory. Maloof agrees. “It’s a stabilizing presence," he said. "It’s Coke – it’s an icon of this country. It has also become an icon of the tavern, and a big part of the Manuel’s experience. When you pull up in the parking lot, it’s the first thing you see.